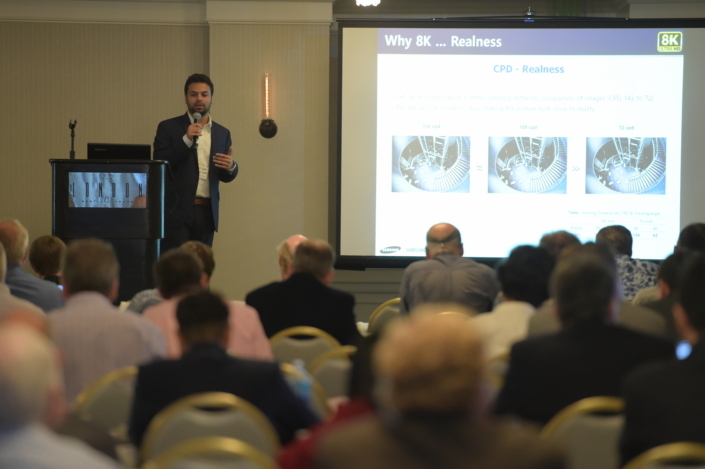 Abhijeet Solat, Samsung Display’s technical sales manager, presented the 8K market trends at QLED & Advanced Display Summit, held in Los Angeles on June 27, 2018. The QLED & Advanced Displays Summit was co-hosted by Samsung and Insight Media, an advanced display consultant focusing on the display industry. During the event, Samsung demonstrated enhancements ranging from HDR10+ mastering workflows to Automatic Color Calibration and no burn-in on its 2018 QLED TVs, showcasing its leadership in the TV display industry. Participants, including industry experts and influencers attended to experience live demonstrations and spark dialogue about the current state and challenges of TV technologies. Above all, the QLED TV demos highlighted Samsung’s efforts in pioneering HDR capability by applying next-generation enhancements for the benefit of consumers. Martin Fishman, CEO of SpectraCal, described the Automatic Color Calibration program (left) and Florian Friedrich of FF Pictures explained the HDR10+ mastering workflows (right) at the demonstration of the summit. For more information about Samsung’s QLED TVs and the QLED & Advanced Display Summit, including speakers and sessions, please visit: www.displaysummit.com/2018-qled-and-advanced-display-summit-at-hollywood.